Another year, another Stead book that seems to have people falling all over themselves proclaiming its greatness. Ideas Are All Around is Philip Stead's expression of the ongoing search for ideas common to artists and writers alike. Being someone who is working at becoming an author/illustrator myself, I have my own conception of what the ideation process is and my own set of real feelings and experiences that have grown from that process. So I had a very mixed reception to this one.There is a lot to admire about this book, especially the pictures. This is undoubtedly my favorite of Philip's illustration work. It has a really light touch. Lots of use of white space, and patchy, stamp-like figures and skylines make for an artful look that is rarer these days in picture books. I was particularly struck by an early page that depicted rain as a pure swath of texture. Then, we are treated to the experimental inclusion of little polaroids juxtaposed with the illustrations. As a whole, it has a very sketchbook-like vibe (minus the type; more on that later). A double page spread of polaroids of the sky makes for a lovely moment of quiet. 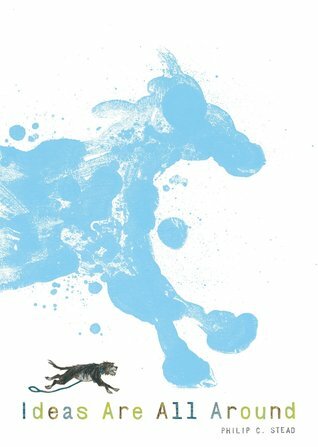 And a surprising splash of pale blue paint resembling a horse, as well as a later reprise of other blue 'story ideas' make for the most delightful moments of the book. Although I wholeheartedly believe it is a solidly illustrated book, I must admit, the visuals appeal to my adult sensibilities more than anything else. It reads like an Artist's Book (if you do not know what I mean by that, google it).This leads me to what troubles me about the book. Is it appropriate for children? This is by no means a question that I ask lightly, seeing as every one of my own stories is deemed too adult for children. There is nothing here that I believe a young child cannot understand with some guidance. My real objections lie with the style in which the story is written. Some people love the meandering route that the narration takes. Maybe they think it is poetic or lyrical or embodies their everyday life somehow. I am not one of these people. As Philip Stead takes his dog for a walk, scares a turtle, sees a train, chats with the neighbor over coffee, I find myself asking, why do I care about any of this? What others might describe as a series of quiet reflections, I found to be mostly boring, bordering on pretentious. This is not an afternoon I feel needs to be described. I would not recount any similarly uneventful afternoon to any friend of mine, whatever their age. Children deserve a little more of an actual story! I really think a bit more entertainment would not be too much to ask. The anxiety of having no ideas, frantic brainstorming, the aha moment, the work--there is a natural emotional arc to this kind of process that Philip Stead misses, or maybe even ignores in favor of his own perceived poetic one. If you are seeking active creativity, look no further than the neighbor, Barbara. Actual stories seem to come from her, amidst Stead's dull list of conversational topics. She seems to be the one who supplied him with ideas. I question the subject matter as well. 'Where do you get your ideas?' is one of those questions that most creative people kind of hate answering, because it often comes across less romantically than anyone likes. There are plenty of anecdotes, some truth, some fiction, about the moments when inspiration strikes. These idea search narratives can make for good stories. I believe it is a story that has been told before in picture books in one way or another, but this is the only time I can recall that a children's author made his own personal ideation process the subject matter for a picture book.Is this entire project author-illustrator navel gazing? I wish I could confidently say no. Maybe this is the reason he removes himself from the visuals in favor of his dog, Wednesday. Then again it might just be that he believes we are being gifted with his writerly point of view. The best evidence against Mr. Stead is there in the fact that he says he uses an actual antique typewriter (in the text of the book) to write his stories. To me, this is embarrassingly affected. I guess this is the justification for the typewritten typeface, which to me is just a reminder of said affectation. All personal qualms aside, what we have been given is an account about how the bits and pieces of a day or a walk can come together to make stories. The pictures alone tell that story well. The writing, much less so, but I suppose, adequately enough. I do look forward to seeing if the experimental approach here may make its way into a more traditional picture book story--hopefully an entertaining one. This would be a good read when teaching a writing workshop mini-lesson on generating ideas. That's exactly what the author is doing on his walk. The illustrations are unusual, but they fit the story perfectly. Put the two together, and you've got an interesting book. Wednesday the dog is a friendly addition as well. Oh man. I was all ready to keep this book at a distance. I generally dislike when artists write about their process as a story. I feel like I've read so many graphic novel memoirs about how hard it is to write a graphic novel. If your only idea is about how you have no ideas, that's fine, but that's process, not product. This seemed to be the same thing, as award-winning author-illustrator Phillip Stead narrates a day when he "has to write a story," doesn't have any ideas, and takes his dog for a walk around the neighborhood. But. Give it a chance. Look at all the layers. There's the multimedia: the story told in monoprints, collage, Polaroids, and typed thoughts. Much the way a series of impressions when walking might have different feels: actual observation vs. visual thought. There is the narrative shift between deep thoughts (war, poverty, ancient history) and sensory observation (birdcalls). The illustrations pull everything together both literally and metaphorically. I'm not actually sure how Phillip Stead pulled all this off. On the surface, it shows what the title says: Ideas are all around. If you're stuck, just go for a walk to see how much the world and your mind can reveal. For deeper readers, there are even more thoughts to think. It can be hard to find picture books about these kind of abstract concepts. Stead may have initially thought he was writing about writer's block (the cop-out idea), but he came up with so much more. I'm glad books like this one, Ask Me, and What Do You Do with an Idea? exist. Stead is talented, but wow is he given a long leash on this one. Seemed like musings packaged as a picture book. The abrupt ending(?) left me particularly unsatisfied, and the pacing was both leisurely and inconsistent. Felt like there was the kernel of a much better book that could have even kept the mopey-ness, but was tighter all around. The illustrations were hit-or-miss for me, too. reviewing for school media connection. this is one I bet reviewers will rave about but it was meh to me. Loved it. Reminded me of Last Stop on Market Street in the best ways. It blows my mind how different his illustration style is to his wife Erin Stead's, but at the same time so similar. Especially the dog and the turtle. I really loved the page turn to all the polaroids of blue skies. And I wonder if the blue horse is a tribute to Eric Carle. I'm excited to share this with 6- to 10-year-olds. They're often asked to write stories in school and will, I think, be able to relate to the author's dilemma. It's all about how you look at the world. This book did not impress me at first glance. As I fanned through the pictures, my nose and eyebrows scrunched together with a “What is this, Mr. Stead?” expression. But as soon as I found the time to really tuck in and read this book, I realized how wrong my first impression was. Ideas Are All Around’s simple charm and beauty won me over page turn by page turn. I will never doubt Philip C. Stead again. *bows head*On the surface, this book is very simple. A writer searching for inspiration takes his dog for a walk around the neighborhood. And you get to decide if he finds anything.Maybe I’ll use my typewriter today.A typewriter makes writing funeven when there’s nothing to say.CLAK-CLAK-CLAK, you take a walk on the page.“Take a walk on the page”—I love that!I adored this slow stroll. It reminded me to really LOOK at life around me. Inspiration and wonder can be found all around! Words, art, paint, polaroids, and life’s simple graces bring Mr. Stead’s walk to escape his block to life. Pages that will soothe and infuse your soul with warmth, thoughtfulness, and creativity. From the blue, blue endless sky to the marks and graffiti on the walks of life. Anything and everything can grab our attention and spark up new ideas! Mr. Stead does a beautiful job of walking readers through a search for ideas and motivation in the day around us.I’m just not entirely certain a child would enjoy this book. Maybe. Every reader is different. And really do picture books have to be for children? This book is art! I hope it finds an audience of all ages.Highly recommended. Though I loved this book, I do wonder how children will respond to it. I feel like this may be a book that an adult needs to share with them. It could be an excellent jumping off point for discussing where ideas for writing come from. Stead captures a day in search of a story to write. He takes a walk with his dog named Wednesday since it’s a sunny day. They greet Frank, a turtle who lives near the bridge. They wave to Barbara a neighbor who owns the home where the author used to live and where he dropped blue paint in the shape of a horse. Ducks float by. Trains rush past. They walk through town and listen to the birds and watch the blue sky. Wednesday chases a squirrel back to Barbara’s house where they have coffee together. And soon a story has been found.This is a treasure of a picture book. It offers a glimpse into the writing process, into the importance of getting outside and taking a walk. It shows how little things turn into stories and become big ideas. It also shows the author as a product of his personal landscape, whether that is filled with a story based firmly in reality like this one or one that is more fantastical or whimsical.Stead’s illustrations are a rich mix of media. There are photographs of Wednesday combined with collage, painting and printed words. Some of the paintings have gorgeous textures that remind me of stencils or the roughness of stamping. The entire book sings with invention and inspiration.A perfect leaping off point for young writers, this book shows that not only can any idea become a story but ideas can become great picture books too. Appropriate for ages 6-9. Ideas Are All Around is a beautiful, meandering, wholly unique picture book that straddles the line between reality and fantasy in a most meditative way. “I don’t have any ideas today,” Stead begins. As he walks with Wednesday, he (and the reader) revel in the beauty that is the process of creating—ideas are out there (they are, in fact, all around), and they are just waiting for us to notice them, to imagine them. Fans of previous Stead books will delight in the winks and nods littered throughout the book: see the animals sitting on the train, reminiscent of the bus spread in Amos McGee; and you just might spot some familiar friends from Hello, My Name is Ruby hanging out in the branches. The collaged art, rendered from polaroids and prints and etchings and other media, are a breath of fresh air that make each page turn an exciting surprise. This is a book to linger over, relishing all of the little details and quiet revelations about the gentle power of imagination. Philip Stead shows us that there are stories all around - you just have to be open to them. It also helps to have a dog that needs to be walked! Great book to share at the beginning of the year to help kick off your writing workshop. It would also be a good mentor text about structure - the photos and illustrations together are wonderful. 3.75 stars. I liked the artwork and the message, but I didn't love the book overall. The story meandered (which I'm sure was intentional) but I didn't like that. It could be a good picture book for older kids, though. More a meditation than a coherent narrative on how artists get their ideas and begin to create. Lovely art and design. If you teach writing, you're going to want this book. If a book leaves you wanting to write and create, then it's done its job. This one does that in spades. Stead's very personal insight into daily life combined with art that emphasizes the glory of imagination in seeing what is in front of you, makes this a very special book. Although Philip Stead is best known for picture books for young children, this book would work best with older elementary students. The picture book format may deceive some readers at first glance, but the content requires higher-level thinking. Stead meditates on things he sees during the course of his walk, portraying these through both illustrations and photographs. He finds, after thinking about what the land used to be in previous eras, that his neighborhood has been through so much, and “ideas are all around,” as his friend Barbara reminds him. The author’s slow, reflective musings would not work well as a read aloud, unless the group was using the book as a starting point for working on a collage project, much like the book itself. Classrooms in grades 2-5 may find this volume useful as a point of study, but few students would choose this book for independent reading. Wonderful book to share with new writers... there is ALWAYS something to write about. In this meditative picture book, the author knows that he has a job to do and a story to tell, but he's stumped for ideas. Combining some procrastination with the need to walk his dog, Wednesday, he sets off on a walk. Along the way he encounters Frank, a turtle, and Barbara, a neighbor, as well as ducks, birds, and a train. I love how he stops and thinks before starting his walk again and how he shares his stream of consciousness, which gives a glimpse into the origin of ideas for books, paintings, and even conversations. Readers will quickly realize that there are stories everwhere, even the most seemingly mundane conversations or sights. Even Barbara's suggestion that war be replaced with fishing has a soundness about it that's reassuring. As I finished the book, I marveled at the creative process described here, longed to stroll the lanes in the author's neighborhood and strike up a conversation, and appreciated the artwork, for which he relied on monoprint techniques and collage. There is so much going on here and so much to consider while reading the book and looking at the blue skies filled with various fluffy patches of clouds. I'll be thinking of this one for a long time, and I will certainly share it with my students who are plagued with writer's block and stumped for ideas. Sometimes you simply have to go for a walk to clear your head and come up with an idea or two. In this case, Philip Stead now has almost too many good writing ideas to count. I don't think he'll struggle with an idea for the rest of the day. A gorgeous picture book about a man and his dog, Wednesday, and a walk they take around the neighborhood. "I have to write a story today," he explains. "That is my job. I write stories. But today I don't have any ideas." On their walk they encounter a turtle named Frank ("someday I hope he looks forward to these smidgeons of time we share. Me and Frank we're in this together after all"); a woman named Barbara who lives in a blue house at the top of a hill; a train; a line of ducks and a heron (it is she who points out that "ideas are all around"); people waiting for the soup kitchen; even woolly mammoths, at least in the imagination.The book is illustrated with monotype prints and collage as well as Polaroid 300 photos. One entire spread is given over to photos of the sky, which (the sky, that is) the author looks at while the people waiting for the soup kitchen lavish affection on Wednesday. The text was composed on a Smith-Corona Secretarial typewriter (also featured in the story). The overall look of the book is airy and spacious, with simple, elegant graphics.The story itself feels rather "adult" in its subtlety. But I like that. This is a book I will surely pick up again and again as a treat for the eyes and a bit of encouragement, when I'm feeling short on ideas. Now, if only I had my own Barbara in my life . . .
A book about not being able to find a story, so the author/illustrator Philip C. Stead goes for a walk instead, and of course, the story is all around him and his dog Wednesday. The ideas are profound, "planing a seed is always a risk", the wonderfulness of a bird in flight and the language delightful "smidgeons" being one of my favorite words here. Minimal illustrations add to the strength of how much is left unsaid but understood. And there are photographs too to root this in the real world. Lots to notice, this celebrates the everydayness of life which is of course what life is all about....thoughts, observations, conversations, keeping up with a dog. Stead has presented us with the essence of a life we can all enjoy. My kids and I loved this book. It reminds me of Mr. Rogers in a way, as the author finds ideas and inspiration in the everyday. I also liked the insight into a real author's day. How do authors come up with ideas? This book shows one way. The artwork is also beautiful and unique. This is how we were meant to live. Ideas Are All Around is that rare picture book that is just as good- if not better - for adults as it is for children. The writing is poetic, the art an abstract combination of photography, stamp-like illustrations, and faint words imprinted to make sound effects, and the content is beautiful, optimistic, and charming. Maybe I just agree with Stead's philosophy. Maybe I just like his dog Wednesday. All I know is that I started off today grumpy as hell, and then I read this book, and I feel much, much better. Well. First of all, I mis-read the title of this book as "Idiots are all around," which, coupled with the description: "In search of writing ideas, an author takes a walk with his dog around the neighborhood," made me think this was going to be like a picture book version of "A Confederacy of Dunces." A book I would read.Second of all, my colleague mis-read the title of this book as "Fleas are all around," which might have also made a fun book, along the lines of David Shannon's "Bugs in my hair. "But as it is, and with this title, I think this book is going to win the Caldecott. Perfect mentor text to teach that stories are all around, you just have to be patient and perceptive enough to look. I loved the mixed illustrations of paint and photographs. Going for a walk with his dog, Stead was able to show us how many "small moment" stories could be told on a day when he just didn't have any ideas. Powerful illustrations on some pages, especially the war plane dropping a bomb that morphs into a fish. This was an interesting book. It was more or less a stream of consciousness that the author put together depicting a walk with his dog. While this was an interesting adventure to follow along with - they walk along a river, visit an old friend, and day dream while looking at the sky - I don't really know what the point of the book is supposed to be. Or maybe that is the point, just going with the flow. Reads a bit like the picture book equivalent of people watching. I like the story and the mixed media artwork, though I'm not sure how it would read for a child. I like the idea that this book really puts the reader into the author's head during the search for inspiration. Mostly I walk away from this wanting to visit the author's neighborhood/liking the armchair visit I took to his neck of the woods. PreK-2. A reminder to not only look, but to really SEE (and hear and smell) what's around you... And let those little things become your story. I like the simplicity of this book & the important underlying theme you can grasp as you look at Philip Stead's Polaroids.